On Wings of Eagles: Who is In Control? What do we do when the evil one continues to knock on our door, announcing day and night that trouble will now be our constant companion? The 100 Years War began in 1337. Nine years later, the English invaded Normandy, France, and Mont-St-Michel, which primarily consisted of an abbey at that time, was soon surrounded by enemy forces. The inhabitants of the island fortress would have had plenty of reason to be discouraged, but they were not. They were, after all, pious men, and Mont-St.-Michel's fortifications, as well as the surrounding North Sea and its fast-rising tides, would be worthy adversaries to the British. 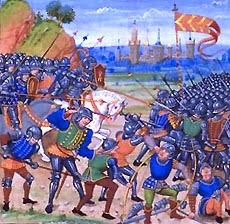 In 1424, the English decided to besiege the islet. After all, these monks could not hold out for long if they were deprived of food and water. The British were starting to gloat. The world was about to see who was truly in charge in Normandy! There was no way the monks could survive this! Mont St-Michel would be theirs within weeks! What the British didn't know was that the inhabitants of nearby Saint-Malo were bringing food and water by boat by night to the poor souls besieged in Mont-St.-Michel. In the end, the siege against Mont-St.-Michel resulted in the British becoming far more discouraged than the inhabitants of the Mont-St-Michel abbey! The British would continue to launch regular attacks against the islet over the next 10 years, until 1434, when the enemy became completely demoralized, abandoning hope of ever conquering this jewel of the North Sea. When the evil one knocks at our door, with his only purpose being to bring about discouragement, we need to stand firm. We need to rely on our Father and not let ourselves sway into despair. Instead, just as the inhabitants of Mont Saint-Michel did when the British were knocking on their doors with a similar purpose, we, with the guiding of God's Holy Spirit, can completely discourage our enemy! After all, if we put the King of Kings as our Lord in all things, our victory is guaranteed! Read Psalms 23 and be reinvigorated with how faithful our Lord is, no matter what our circumstances might be. After all, "The LORD is my shepherd, I lack nothing." (Psalms 23:1) Or in other words, putting God on the driver's seat will lead us to an out-of-this-world abundance. One thing we will realize sooner or later: When we think we are in charge, we truly are not! Have you ever crossed a border? What if you took the wrong passport with you and you gave the border guard your wife's passport instead of yours? It happened to one of my friends. The border guard was laughing when he asked: "Hey! Your hair was much longer when this picture was taken!" What about receiving a performance evaluation and noticing that the wrong named is mentioned: "My name is not Jack" And when comparing evaluations with Jack's, you find that the two performance evaluations are identical, except for the name. A blunder from a poor vice-principal. However when we hand everything, and I mean everything: house keys, wallet, job concerns, health worries, broken relationship nightmarish scenarios and anything else that may occupy our thoughts, to God, something particularly special happens. Worry seems to evaporate into nothingness. God is truly in control! It's true that at times some concerns seem to reappear from seemingly nowhere, but each time this happens, we need to wonder: Have we left that particular concern in God's hands? Or have we stolen it back, as we are the ones who want to be in control over that specific circumstance? Do we want to be stress free? Do we truly desire that our worries evaporate into nothingness? Maybe, just maybe, it is time to give all control to the One who can handle it! After all, He is the One who encouraged us to, "Come to me, all you who are weary and burdened, and I will give you rest." Matthew 11:28. Truly we can defeat the evil one by discouraging him, rather than the other way around! After all, isn't God the One we leave control to? Dear Lord, help us give you the control of our life in everything. Once we do Lord help us not try and take the control back. In Jesus’ Name, Amen.